Fall is officially here, with threats of frost. After I put Charlie on the bus this morning, I played this game (which I have played in many seasons past), where I walk around the gardens and complain that there are no flowers left to cut. "I can't possibly pull any cohesive arrangement together with what's left in the garden," I mutter to myself. And then I spot a few prime dahlias, run inside to grab my clippers, and begin the process of convincing myself otherwise. After gathering a few red, single petaled "Bishop's Children" dahlias, I decide to base the bouquet around this bright and cheery color, unlike most ivory and blush bridal bouquets I often make. Then I head over to the "veggie" garden (which I should admit has more flowers than veggies planted in it these days) where I spot some lovely, tall Red Gem marigolds that I grew from seed sent to me by my mom this Spring. 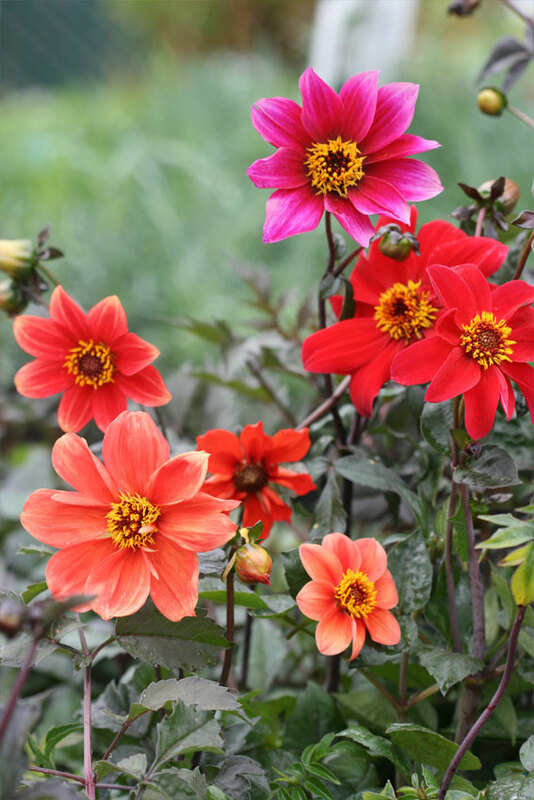 The orange and red variegation compliment the red dahlias perfectly. Their delicate, tiny flower heads are starting to give the bouquet and airy feel already. I raided the zinnia patch looking for any and all primary colored ones available that haven't been completely absorbed by the downy mildew they are usually covered with, this late in the season, along with a few interesting Jazzy Mix zinnias, which come in yummy warm tones and unusual stripe combinations. Added a bold ribbon and voila! Wedding reception centerpieces can be romantic, simple, sweet, and downright awe-inspiring. When approached correctly, a floral centerpiece can transform a table and enhance a room by way of color, dimension, and design. Below are some unique wedding centerpieces I've enjoyed designing and creating over the years. The romantic juxtaposition of leafy greenery and fresh blossoms makes budding swags & garland a romantic floral design option for wedding ceremonies and receptions. Below are a few of my wedding day favorites. I designed this swag for the back of a Bride & the Groom's chairs at a long, shared head table. The use of grainy wood signage donned with floating flowers makes their seats a little more special while not competing with the symmetry and functionality of their dining space. This romantic arbor, laced with monstera leaves, coulter pine, peonies and cabbage roses is a dreamy place to exchange vows and take wedding day photos. Lacing both sides of the wedding aisle with leafy foliage and delicate roses is a romantic statement piece for an outdoor wedding. This bride & groom wanted long, leafy centerpieces to cascade across the dining room tables at their wedding reception. And, quite frankly, their whimsical wish was so fun to create. Using leafy greenery and roses accented by twinkly lights made the otherwise rustic and modern room feel soft and magical. Ride out in style with a "Just Married" swag for the back of your vehicle. Cabbage roses, peonies, eucalyptus leaves, asparagus ferns are just a few reasons why I love this trunk swag so much. To design unique wedding day swags & garland, be sure to contact Bittersweet Gardens here. Having been a wedding day florist for quite some time, I can say with a deep-level of certainty that classically structured bridal bouquets aren't leaving us, or the wedding aisle, any time soon. However, I am loving this year’s dreamy interpretation on bridal florals which errs on the side of non-traditional yet still feels luxe and wedding day appropriate. Think traditional wedding bouquet meets Havana-inspired florals. This year’s bride is ditching structured wedding flowers for a loose assortment of proteas, asparagus ferns and monstera leaves. This look, when paired with wedding day white, can add visual interest and just the right amount of whimsy. While wrist or pinned corsages are classic and beautiful, this year’s honorary guest may be seen carrying, instead of wearing, a simple bouquet. The use of three blossoming peonies or cabbage roses are lightweight enough to hold with one hand and are an elegant take on an otherwise traditional wedding day staple. This year’s bride and her maids are all about flowers as jewelry. Simple hair combs or half halos, comprised of delicate florals, can perfectly accent romantic bouquets. While, oversized floral crowns, fixed with sprigs, berries and greenery, may be used in lieu of or in addition to coordinating wedding day florals. After Pantone announced "Greenery” as its “color of the year,” it’s no surprise that we’re seeing foliage and shrubbery really inspire this year’s bridal flowers. The use of layered, leafy greenery as a romantic statement piece adds dimension and volume to a bridal bouquet and allows for the flowers to really stand out in such an elegant way. When tied together with wedding day ribbon, you have such a fresh, ethereal look. The “just picked from the garden” bouquet is something that many brides are looking for these days. Long gone are the days of just selecting "matching" flowers that may be in season. This year’s trend is all about working with flowers from a nearby garden or farm to be used in a bouquet to give that fresh from the farm feel. 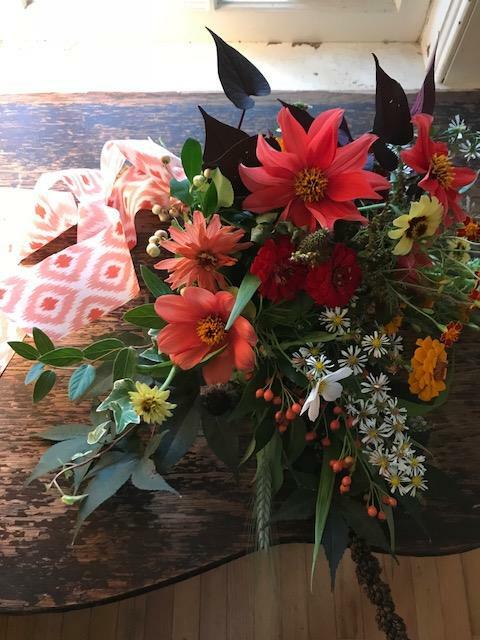 As a farmer-florist, I grow and source the fresh, organic flowers so that the bridal bouquets I design are harvested by hand, often, the morning of the wedding! For information on any of these trends and to explore harvesting your wedding day flowers together, please contact Bittersweet Gardens here. One of the first flowers to bloom for us on the farm are our daffodils. Not just the standard canary yellow any more, daffodil colors can range from white to pale yellow, a touch of orange or pink, and even green! Owning the latin name, Narcissus, there are 13 different divisions of daffodils - large cup, small cup, double (my favorite), and trumpet, to name a few. 1. Deer have a distaste for the them, unlike my poor tulips. 2. Many will naturalize for you and spread from year to year. 3. They are low maintenance as long as they are planted in a fairly sunny spot with good drainage. Daffodils planted in too wet a location will rot. When cutting your daffodils to bring their beauty indoors, make sure to only cut the stem, and not the foliage. This will ensure ongoing blooms in future years. The leaves need to remain on the bulb to continue to photosynthesize, thus delivering stored energy back to the bulb for next year. Lastly, I always condition daffodils for 24 hours separately from other flowers after I cut them. This allows the daffodil sap in the stems to drain out into the water, as the sap can interfere with other flowers' ability to hydrate. After that, they are safe to mingle with other flowers in an arrangement, bringing their beauty to your table!